I’ve heard many people say, “Turkeys are meant to be shot in the head with a shotgun.” The gist is that a turkey brain-rocked by a swarm of dense shot is going nowhere but down. There is peace of mind in that, and toting a shotgun certainly puts you more in control of the hunt. Of course, most turkey hunters who are serious bowhunters during the fall are eventually bit by the I-want-to-kill-a-turkey-with-my-bow bug. Turkey hunting with a shotgun isn’t always easy, but if you’ve become good at it, perhaps it doesn’t feel very challenging anymore. 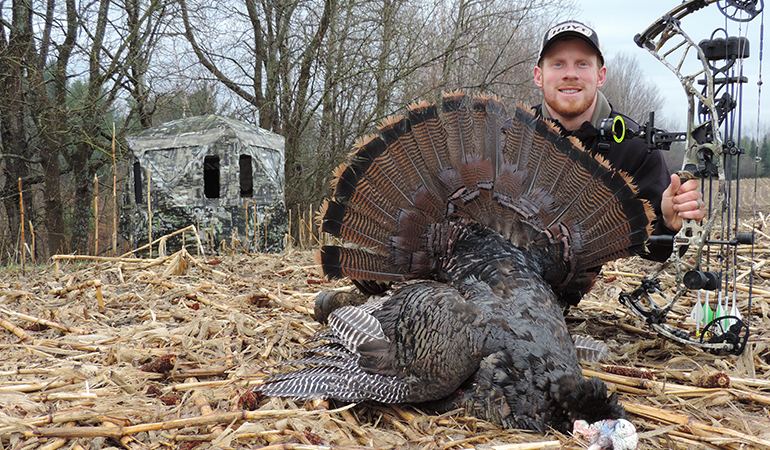 You can add excitement and challenge back into turkey hunting by laying down the shotgun and picking up your bow. If you’re ready to make the leap and hunt spring gobblers with your bow, let me help you taper the learning curve a bit. Following are some tips that have helped me bow-bag dozens of turkeys over the last 18 years. The most exciting aspect of bowhunting turkeys is that, to kill them consistently, they must be close. I rarely kill a bird beyond 20 yards anymore. When a bird gobbles, spits and drums within 20 yards, it’s an entirely new level of exciting. But pulling toms within 20 yards isn’t always easy, so let’s consider our options to get that top-pin shot. I bowhunt turkeys without a blind as often as I do with one. My approach is based almost solely on the amount of pre-hunt scouting I’ve done. If I know birds are on the property but haven’t seen them do the same routine for several consecutive mornings, I usually go blindless. 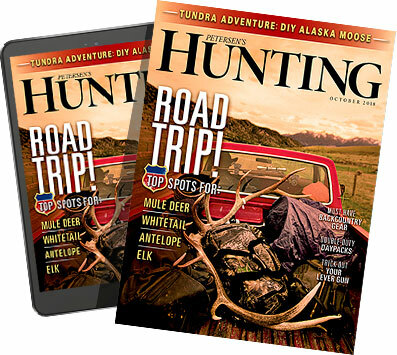 I dress in camo from head to toe, pack a folding saw in case I need to craft a quick blind and head onto the property with my bow and decoys — a very mobile approach. When the author watches toms frequent the same spot daily, he gets there in the pre-dawn darkness and sets up a ground blind to seize the high-odds opportunity. Once I hear a gobbler, I move in as close as possible without being spotted, then choose a setup location where toms approaching my decoys will move behind trees or other obstructions so I can draw my bow undetected. I place my decoys 15 yards away. I call almost exclusively with a mouth call to eliminate movement. I’m not going to elaborate on calling since I rely more on my decoys and less on calling for a top-pin shot. The beauty of a mobile approach is that if the bird(s) move in another direction, I’m not tied to my initial location. I can move to subsequent setups and try to make something happen. It works well for me, and I find that I hunt fewer hours and kill more birds. That said, I’m a big advocate of using ground blinds. When I’ve patterned birds that do the same thing every morning — especially in ag fields — I want to be in the exact location they’re frequenting. I can do that with a ground blind. Unlike deer, turkeys (unless they’ve been majorly educated) will accept a ground blind placed in the wide open, especially with realistic decoys placed 10 to 15 yards away. I’ve arrowed many gobblers from this exact setup. If turkeys are frequenting a large field daily but not in the same exact spot, I choose the highest point in the field as my setup. 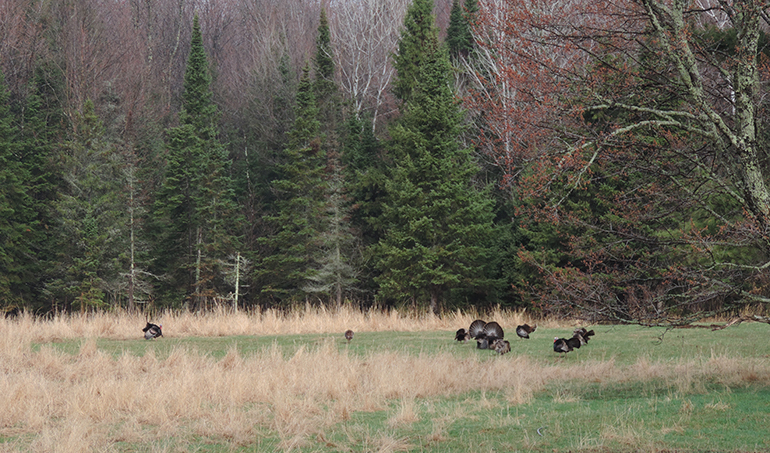 This makes my decoys most visible, and for whatever reason, turkeys are prone to approach decoys uphill from them. I’ve never had a gobbler come downhill to my decoys. If I had to choose between using cheap decoys with great camo or using mediocre camo with expensive, realistic decoys, I’ll choose the latter every time. I used cheap decoys during my early years of turkey hunting with very sporadic results. I switched to Dave Smith Decoys 10 years ago, and they paid for themselves right away in the time they saved me. I haven’t done the exact math, but I’d say eight out of 10 toms respond to them. What’s more, they lock onto them so intently that I can draw back undetected. I almost always use one hen and one jake. Why? Because it works and I see no sense in bogging myself down with the additional weight of more decoys. When hunting without a blind, I wear a HECS suit underneath my camo, which makes my electromagnetic fields undetectable. I carry a small folding chair so that I can keep my bow cam above dirt and vegetation while shooting. If you don’t have a ground blind and want to hunt from one, you have two options. Either borrow one from a buddy or buy one. If buying, consider it an investment. Cheap blinds don’t last. Buy a blind made from quality materials, take good care of it, and it will last you decades. Thus, you can justify spending more. I have two Primos Double Bull blinds — the Darkhorse and SurroundView 270 — and both are great for deer and turkey hunting. The exact bow setup you use for deer hunting will work well on turkeys. Some folks reduce their draw weight, which is fine, but I don’t. I want to set up my bow once for the entire year. I don’t want to reconfigure sight pins or sight tapes after turkey season, so I shoot the same setup for turkeys as I do for big game. Broadheads are very important. A small broadhead placed through a bird’s lungs will do the trick every time, but the lungs are a tiny target that even the best archers cannot hit every single time during a hunting situation. As a bowhunter, the worst nightmare is thumping a bird and watching him go airborne into the unknown. And that can happen if you miss the mark even slightly. For that reason, I shoot big, forgiving mechanical broadheads. First, the additional cutting diameter will often compensate if a marginal hit is made (don’t use that as an excuse to attempt low-odds shots). Second, the shock a large mechanical broadhead transfers to the bird on impact is astounding. That combined with the large cutting surface will help anchor a bird more quickly. Having shot birds with both fixed-blade and mechanical heads, I’m putting my money on mechanicals. In the past, I rushed more shots on turkeys than I care to admit. It gets really exciting when a boss tom is pummeling your decoy 12 yards away. It creates a false sense of urgency to shoot quickly. I’ve learned to ignore that anxious feeling. I make sure the tom is still and that I know the angle at which he’s standing. 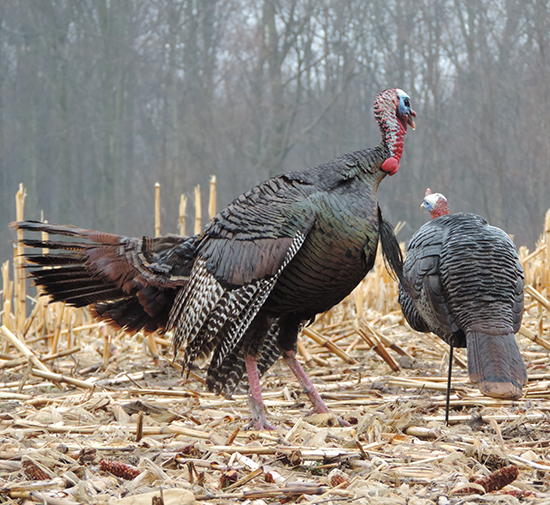 A tom locked on the decoys will usually give you all the time in the world — no need to rush. Aiming at a gobbler pummeling your decoy 10 yards away is exciting business. Slow down, take your time and make your shot count. Now, you’d be surprised at how many turkeys are missed or hit marginally at 10-15 yards. A strutting tom is mostly feathers, so if you don’t know the anatomy and how to place your arrow according to the angle, it’s very easy to botch a gimme, especially if you rush the shot. Study anatomy diagrams online before and during your hunt, and then when an opportunity presents itself, SLOW DOWN. Don’t just aim for the center of the bird and hope for the best. Choose the feather you want to hit and fixate your sight pin on it. Trust me, rushed shots will lead to lost birds. Don’t settle for that. There’s a level of fear that comes with downgrading from a long-range weapon to a more primitive or short-range weapon. I mean, why lay down the sure thing and make things more difficult? You’ll know the answer when you bow-kill a gobbler from 10 yards as he attacks your jake decoy. It’s a rush that keeps me toting my bow every spring.